In view of the visit of PM Modi at Itanagar on 15.2.2018, the District Administration Capital Complex has made the following traffic arrangement . There will be no vehicular movement / parking on the route from Raj Bhawan to I.G Park in between 10:10 am and 10:40 am and then between 11:10 am to 11:40 am on 15.02.2018, for smooth passage of the VVIP carcade. The vehicles coming from Naharlagun towards Itanagar will be diverted at Pappu Nallah – Jully tri-junction from 09:00 am to 11:30 am on 15.02.2018 towards Jully – Ganga, Itanagar. The vehicles coming from Chandernagar side going towards Naharlagun will be diverted away between 10:00 am to 11:40 am on 15.02.2018 towards Jully – Ganga road, Itanagar at Ganga Jully Trijunction. Vehicles shall be avoided on roads leading to the Helipad, Raj Bhawan,Raj Bhawan Trijunction, Mithun Gate, Zero Point, Bank Tenali and Niti Vihar Gate of I.G. Park between 10:00 am to 11:40 am on 15.02.2018 to avoid inconvenience. All buses (carrying invitees) coming from Ganga side to IG Park will deport them near DSector gate and will be sent to Naharlagun to park at Yupia road. All buses carrying invitees coming from Naharlagun side will deport them near D Sector gate and will be sent to Gangaside to park at Chimpu Hollongi road. However the Vehicular traffic is open on NH-415 from Itanagar to Naharlagun and vice –versa from 7 AM to 8 PM on normal days as follows. The NH-415 from Itanagar to Naharlagun shall remain closed for traffic w.e.f. 8 PM to 7 AM till 31/03/2018. The order stated that if congestion of traffic is occurring at any of the work sites, then the traffic may be diverted through Jully road temporarily till the vehicular movement on the NH415 improves. The order was issued after it was observed that the traffic congestion in the twin city have increased many folds resulting into inconvenience to the commuters. 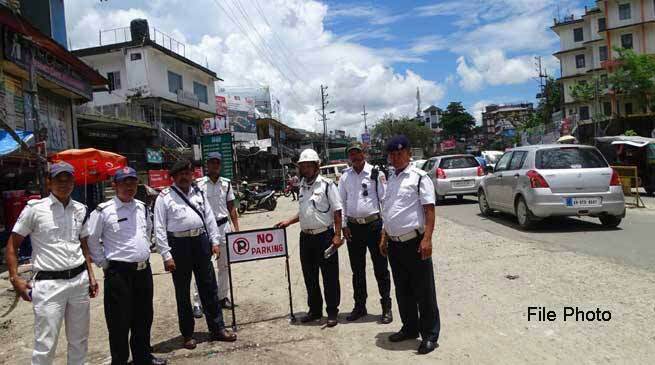 Earlier an order was issued restricting the vehicular traffic in the NH-415 from Naharlagun to Itanagar and vice for early completion of the 4-Lanning of NH415 from Chandranagar to Papu Nallah, Itanagar.